I’m still all over the no-nail-the-same trend so I allowed my mind to wander on the rest of the nails. I used Orly Fancy Fuchsia for the base color for my thumb and pointer fingers, Zoya Purity for my middle finger and Wet n Wild Fast Dry Ebony Hates Chris on my ring and pinky fingers. Hope you like! This Valentine’s Day theme is fun! 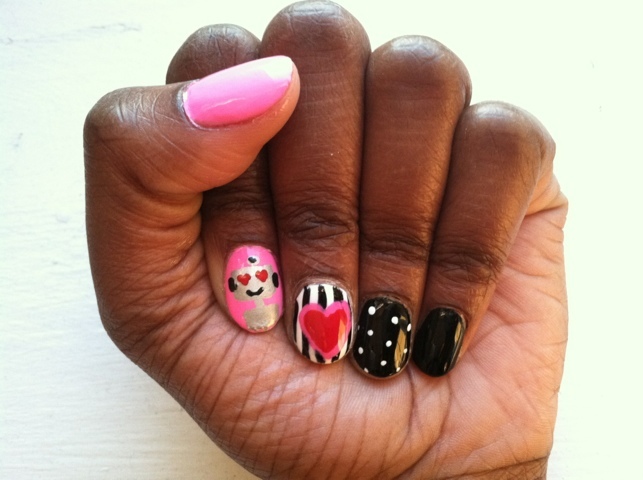 Posted on February 9, 2012, in Trend Watch and tagged robot manicure, Valentine's Day, Valentine's Day manicure. Bookmark the permalink. 1 Comment. This is really cute, especially the robot.